A registry tweak for command line warriors, even with the latest Windows AERO theme power users still prefer the command prompt to accomplish certain tasks. But navigating through folders and subfolders is painful especially if the folder names are long containing numbers and alphabets like a3f5a2ed3eea41ec9b2198da. Add a command prompt option to the context menu so that you can simply right click any folder select “Command Prompt” and the Command prompt opens with the specified folder as the working directory. Never skip this step always backup the registry before proceeding. Go to Start -> Run or type [windows key] + R type regedit to open the windows registry editor. 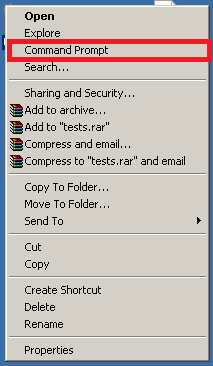 Open File menu click export, select a safe location, enter a meaningful file name using which you can identify before what change you did the backup. The file is saved as file.reg. To restore from the file in case something goes wrong, from the File menu in the registry editor select Import navigate to the file location and select the .reg file.